​Now in existence for almost 15 years, River Ranch Educational Charities (RREC) is a 501(c)(3) non-profit corporation that has served over 250,000 children and their families with free community and educational events, provided over 1000 scholarship services and donated over $1.7M in goods and services to those in need. There are two types of donations that can be made to a 501(c)(3). A cash donation is the obvious one. However, another way to give is by an in-kind donation! ​In addition to individuals, generous corporations and businesses are a common source of in-kind gifts. If you haven't given to River Ranch Educational Charities yet, an in-kind donation is a great way to start a relationship with a wonderful charity! HELP KEEP OUR MISSION STRONG! 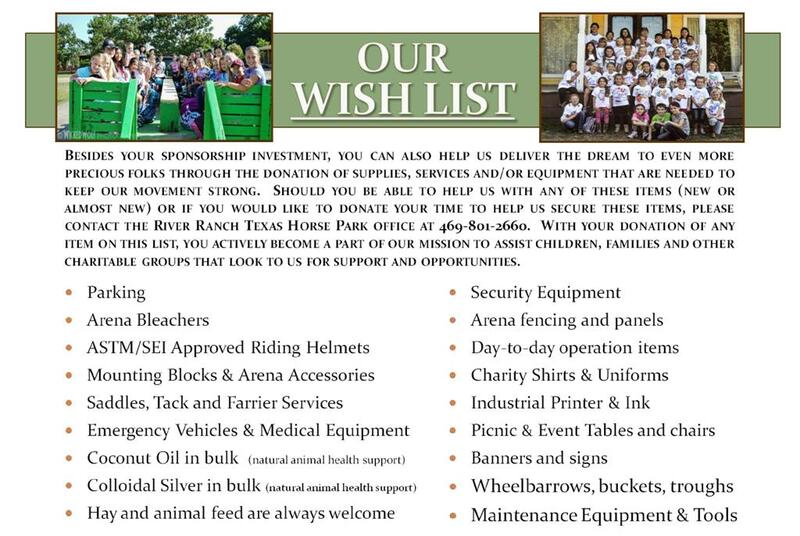 DONATE AN ITEM FROM OUR WISH LIST & BECOME A SPONSOR TODAY!